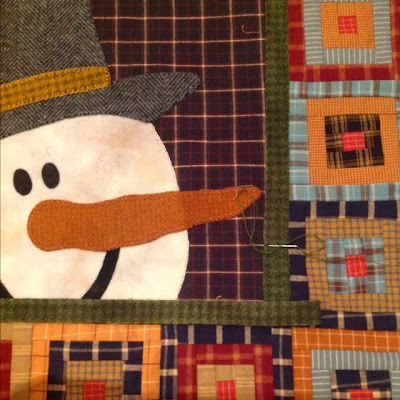 The snowman quilt I was working on at the retreat is slowly coming together. I really love working with wool, so there might be a little more of that in my future. I just need to find some cute patterns. Last night was our October quiltguild meeting, and the theme was " first and latest". Everyone brought their first quilt ( or "quiltlike item") and their latest finish. It was so much fun to see all the different "first" projects. You can see the pictures on the Fjellquilten blog www.fjellquilten.wordpress.com ( I don't know how to add links on my pad....) THE LINK IS ADDED... It was such a fun evening! Hope you have a lovely weekend, thank you for stopping by! Oooh, that would be a fun idea for a linky party -- have everyone post their first quilt along with their latest. It would be fun to see how everyone's tastes have changed!